I love the space you created, and it's right on time for the holidays. It looks so fresh and pretty! Beautiful job, the hard work was worth it! Are you kidding me? Brandi, it is amazing! For a kitchen reno on a small budget, really just paint and a lot of elbow grease it looks high end. You did a great job. It is so bright and airy now. I cant believe you just painted your backsplash Brandi! looks fabulous!!!! Love the new look and your island/table is just perfect as well! Enjoy! Oh my goodness! It’s amazing!! I LOVE LOVE LOVE The island! Congrats! I love it Brandi! You did a great job. Where is your kitchen island from? Okay Rachel had me curious about that instantgranie, and now you've really got me wanting to try it! It looks amazing! Love all the changes you've made! The island is a great touch! This looks amazing! Painting your backsplash .. what a brilliant idea! Looks great, Brandi. What a transformation! Cheers to your new, bright kitchen! Looks fabulous, Brandi. Can't believe you painted the backsplash and it looks so fresh. Also, love your new island. Great job. Brandi, I love your style, you definitely have a great eye for design and it shows in your kitchen. Beautiful. It does look fresh and pretty! You have a natural gift for design! Oh... I love it! 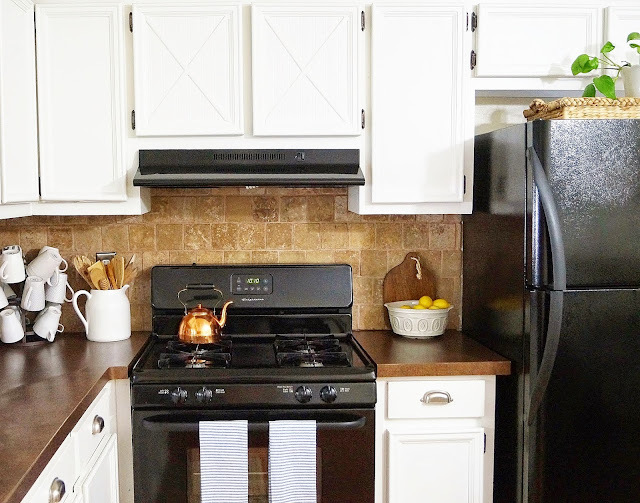 My white painted cabinets need a makeover too. I want to keep them white, but just clean them up and add new hardware. Thanks for the inspiration. The kitchen looks great! I love the Instant Granite. I really hate our counter tops, but don't want the expense of granite. This could be a nice alternative. Oh my goodness, you did such incredible job! Painting the cabinets is a lot of work but it's so worth it. It all looks beautiful! I love the painted backsplash and the new island. Enjoy your pretty kitchen! You did an amazing job. Looks gorgeous. Stopping by from Tip Me Tuesday. Wow! What a difference! I would love for you to stop by diyhshp.blogspot.com and link this up to my More the Merrier link party. Brandi, What are the dimensions of your kitchen?